London is a family-friendly city with loads of things to do with kids. My kids are aged 10 and 11 and this is what they enjoyed on their first visit to London – in random order. 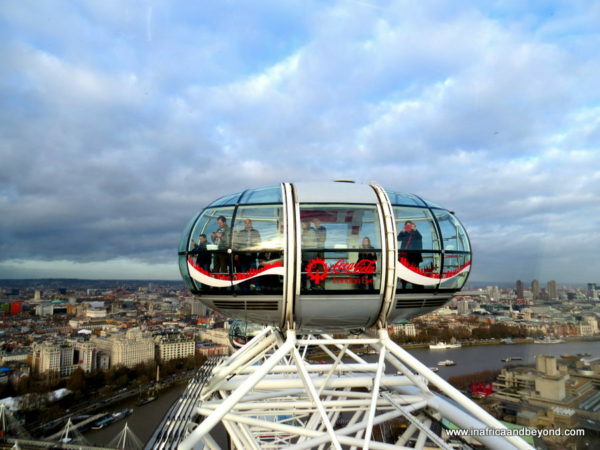 The Coca-Cola London Eye was the first attraction we chose to visit in London because the kids had heard – and read – so much about it and were eager to ride it. It was built as part of London’s millennium celebrations and has become one of the modern icons of the London skyline. 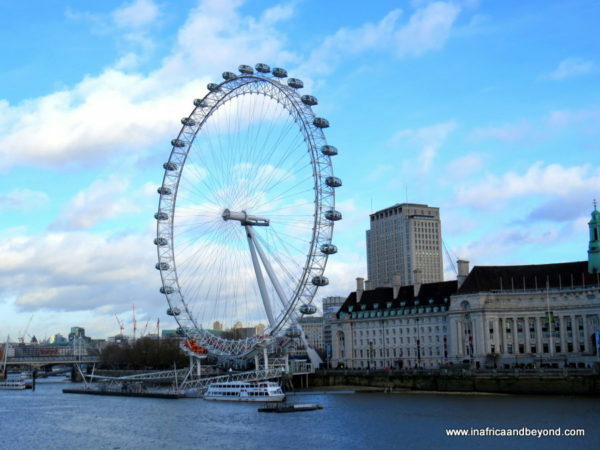 Much more than a ferris wheel, the London Eye is the world’s tallest cantilevered observation wheel. The futuristic looking capsules allow you to gain panoramic views of London unfolding before you, while you sit in comfort. The interactive touch screens give you information on what you are seeing. The 32 capsules can hold up to 800 people at one time and a complete turn takes about thirty minutes. Kate Moss has enjoyed 25 rotations and Jessica Alba has been on the wheel 31 times. We were suitably impressed too. The London Dungeon is a fun, interactive, sometimes cheesy and sometimes creepy journey through London’s history. Key historical events and sinister characters such as Jack the Ripper, the plague and the torture chambers are re-enacted by skilled actors in theatre-style as you walk through the dungeons, led by staff members. Audience members are chosen to participate in the various acts. I was thrown into the docks for treason and my son was on trial for pinching young ladies’ bottoms. There are also two rides included in the experience and a free drink… if you survive. If you have teens or tweens, this is a must. 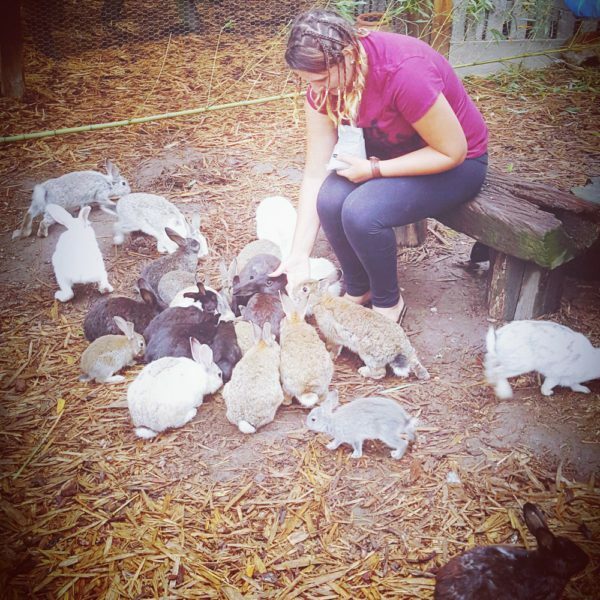 The kids loved it and we laughed about our experience for days to come. This was another attraction that the kids were eager to visit before we even went to London. We got to hobnob with celebrities like Usain Bolt, One Direction and the British Royal Family at Madame Tussauds, the most famous wax museum in the world. It is probably the closest we’ll ever get to them. Most of the models looked uncannily real and my kids had great fun imitating their poses. Then we were terrified by the gruesome Chamber of Horrors, before we were escorted onto the Spirit of London ride. The mini-replica of London’s infamous black cab took us for a ride through London’s history. That was not all. We then went to watch the Marvel Superheroes 4D movie which the kids loved and visited the new Star Wars experience which contains wax figures of the favourite Star Wars heroes and villains. I have a soft spot for views from lofty places and the Shard is the tallest skyscraper to grace the London skies. It is also the tallest building in the European Union. The spire-like structure appears to emerge from the River Thames and boasts spectacular 360-degree views of London. There is an indoor viewing gallery on Level 69 and an open-air viewing gallery on the 72nd floor. The kids were fascinated with the interactive audio guides and the strategically-positioned Tell:Scopes that enable guests to see London by day and night and provides information on over 200 landmarks in 10 languages. You can also use the wi-fi “in the sky” to share your experience on social media. 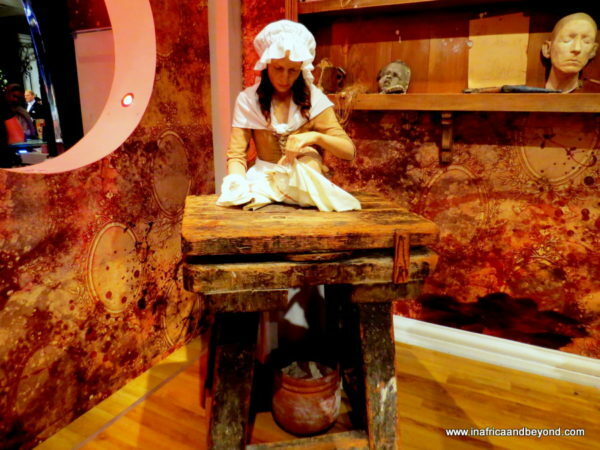 All the other attractions on this list had been planned and scheduled by me before we went to London but when my kids saw Ripley’s and what it was about, they were really keen on going there and so we went on our last day in London. They now wholeheartedly agree that it was one of their favourite attractions. There are 6 floors containing over 700 extraordinary artefacts and exhibits, some interactive, collected from around the world. We were blown away by the hurricane simulator, got lost in the mirror maze and lost our balance in the Black Hole tunnel. It was great fun! Harry Potter fans will recognise this as the location where Hogwarts students run through the wall to get to the Hogwarts Express. It is totally free to visit and you can get a photo of yourself “going through” Platform 9 ¾ . Staff members dressed as Hogwarts students help you to pose for your photo with a Hogwarts scarf and a wand while holding on to the trolley. After you’ve got that photo, you can visit the gift shop where you can purchase all sorts of fabulous Harry Potter merchandise. During the Changing of the Guard ceremony, one regiment of the Queen’s guard takes over from another. The kids will be impressed with all the uniquely British pomp and ceremony outside the massive palace. The best view is from the steps of the Victoria Memorial. The ceremony lasts for 45 minutes but does not take place daily. See the website for dates and get there early. 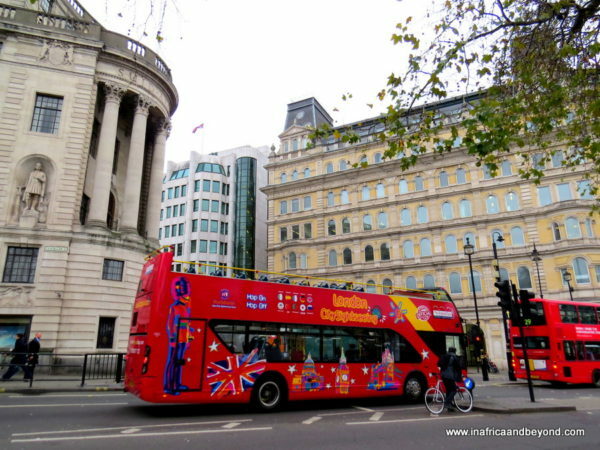 The Original London Sightseeing Tour started the first sightseeing bus tour of London in 1951. It is a great way to explore London in comfort and with invaluable commentary. Free walks and river cruises on the River Thames are included in the ticket. Kids get their own commentary and activity pack. Read about our experience here. If your kids have studied the Greenwich Meridian in school, as mine have, take them to the Royal Observatory in Greenwich – where they can stand over the GMT line, with one foot in the Western hemisphere and one foot in the Eastern hemisphere. It will make it more real to them. They can also visit London’s only planetarium here. Also, in Greenwich, you can take them to visit the Cutty Sark, one of the world’s most famous ships. Museums are not every child’s cup of tea and my children are no exception. But the British Museum boasts a fascinating collection of treasures from around the world including the Rosetta Stone and Egyptian mummies and this will be sure to intrigue the children. It’s also free to visit as are many of London’s top museums . See this great guide on Where to stay in London. Or book accommodation here. What are your top things to do in London? Very nice post. I just stumbled upon your blog and wished to say that I have really enjoyed browsing your blog posts. I’ll be subscribing to your feed and I hope you write again soon! It can be difficult to write about this topic. I think you did a fantastic job though! Thanks for this! Thank you Rohini. There is so much to do in London that drawing up a short-list is not easy. Thanks Amina. I was amazed at how kid-friendly London is! Thanks for sharing such vivid and come to life snaps . You’re lucky to live here Umme Hafsa. Thanks for sharing…planning to go London in the summer. Most of these are on my list. Hope you get to go soon Kai! Use to visit London before I had kids, now I know things I can do with them there when they get older. What is your favourite spot in London Umm Asiya? Visiting museums are among my favourite things; I can visit the same one over and over again especially if there’s a special exhibition going on. I also love lofty building with great views. I enjoy them too Amina. And museums like The British Museum always have special exhibitions going on! Thanks for sharing! It’s really well written and informative. Makes me eager to visit there one day insha Allah! Thank you Aussiepursuit. I would love to visit Australia next year! No bookshop? All look like fun. Oh travel money, travel money. Haha, my daughter is a huge bookworm so we had to go to Foyle’s Bookshop. We also went to the British Library but we we couldn’t access the children’s section because we didn’t have access cards. You are welcome Papatia. I’m glad you find it helpful. Thanks Zara – London certainly has a lot to offer!